It has been two years since I had last been in Hiroshima and it was my fourth time to visit Hiroshima as well. On the surface, it looks like I love Hiroshima but in reality, it is just a place where I couldn’t do everything that I wanted to do in one single trip. My first trip to Hiroshima was with a good friend of mine who was visiting Japan. It was my first year in Japan and we only made it to Hiroshima Castle and the Peace Park. I soon learned about Miyajima and decided to go there a year later. I had a bit more time to enjoy the Peace Park as well but focused more on Miyajima. Two years ago I had my epic road trip to the San’in region and stopping in Hiroshima on the way home. Epic is the best word to use as it was nearly two weeks of travelling by nearly all means of transportation. That trip would see me visit Miyajima more than Hiroshima and that’s about it. This time my focus was also about visiting areas outside of Hiroshima city as well as going to a baseball game, which I wrote about in Japanese Baseball. Upon my arrival into Hiroshima Prefecture, I headed straight to Saijo, a small town well known for its sake. Saijo isn’t very well known outside of Hiroshima but it is a lovely little town and I did write about Saijo. While I spent most of the day travelling to Hiroshima and walking about Saijo, I did spend the evening in Hiroshima itself. It was a great time as I have a friend living with his family in Hiroshima and it had been nearly 2 years since I last saw him. I was happy to meet up and catch up with him and also to meet his beautiful family. 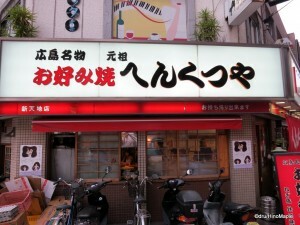 We did what most tourists to Hiroshima must do when visiting Hiroshima, we ate Hiroshimayaki. It was a nice experience and we went to one of the few Hiroshimayaki shops that I know of, Henkutsuya (へんくつや). It is a delightful shop that was in the guidebooks a couple years ago, but not anymore. We went there a couple years ago with other friends but this time it was just the two of us. We did see another foreigner, easy to tell because this guy had white skin and blonde hair, who offered us the English menu. I politely said we didn’t need it as I always prefer to use the Japanese menu. It serves a couple purposes, one is to improve my reading ability, and the other is to blend in with the other people, somewhat. I can’t help but feel that I was a bit rude or pretentious in saying I didn’t need it, but it was true. I also felt a bit mean as the guy was alone and seemed to need someone to talk to, but it had been a couple years since I last saw my friend and we had a lot to catch up on. We ended up walking around Hiroshima a little while I did some sake shopping before settling on going to Seikai no Yamachan, a Nagoya chicken wing chain of izakaya, that was near my hotel. No need for super fancy places when just a few drinks would suffice. The only saving grace was that I decided to drink Saijo sake which they had on the menu. The second day in Hiroshima was a dramatically boring morning for me. I was heading to Kure to see the Yamato Museum but it was also a stormy day. Hiroshima was cloudy but not too bad, but between Hiroshima and Kure there was a huge rain storm. My train stopped on the tracks on the way to Kure due to the heavy rain, but the station I was at was quite bright with no rain, just clouds. I waited for nearly an hour before I turned around and headed back to Hiroshima disappointed that I couldn’t go to Kure. I decided to head to Shukkeien instead, which I was going to see anyways. I would go there earlier than planned and I had about an hour scheduled to see the park. I walked there from Hiroshima Station and the park was wonderful. 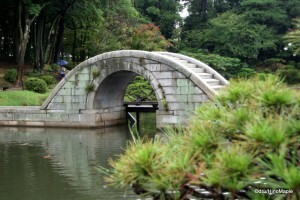 It had a central pond with a stone bridge in the middle. The stone bridge was flat with a hump in the middle. The hump was actually a little dangerous to walk on as it was a narrow bridge and the hump was a little wet. Slipping off the bridge was a high probability so I decided not to go over it. Instead I walked around it on a small wooden bridge built to bypass the stone hump. The entire garden is very nice. It was originally built in 1620 as a private garden but opened to the public in 1940. 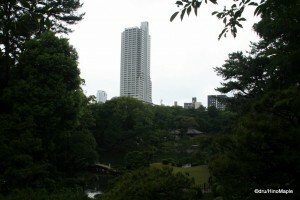 Due to the bombing in Hiroshima, the garden was nearly destroyed but it was reopened in 1951 after it was repaired. It is a lovely garden with interesting landscaping in every corner. Follow the tour route that is relatively well marked and you’ll be able to see all of the main sights as well as the best views of the central pond. After visiting Shukkeien, I had a wonderful lunch at an Italian restaurant with a beautiful terrace on the river. It was a great place to just chill and people watch. I then went to the Fukuya department store, on the south side of Hiroshima Station, to buy Hitotsubu no Muskat, a seasonal dessert from Hiroshima. I had been searching the entire station area before deciding to go to the department store across the street to see if they had it. I was in luck and quickly bought a couple. My friend then made a comment that we should go to “this shrine just behind here”. When I heard this phrase, I thought it wasn’t too far and just a quick walk across the river. What he meant to say was, “let’s go to this shrine on the other side of Hiroshima Station that is up a mountain”. I regretted saying yes to going and we proceeded to head across the station and towards the temple. We did ask for directions from a construction worker near the station and he told us that the temple was just around the hospital. We can walk up to it from behind the hospital and it would take about 5 minutes. As always, I didn’t believe him and what he meant to say was that it takes about 5 minutes to get to the other side of the hospital! Communication problems have reared its ugly head, but I figured it would take about 30 minutes. We proceeded on a 30 minute hike up the road that took us up the mountain side. We finally reached Nipponzan Myohoji after about 20 minutes. The main temple is located at the bottom of the temple grounds so we still had to walk up a lot more. We decided to go straight up using stairs that took us through a grave yard. We stopped about halfway so I could take a photo or two. Upon reaching the top, we got to the Peace Pagoda, which is more of a stupa than a pagoda. It was really nice to see from the station and you can easily see it from the station if you look north to the mountains. 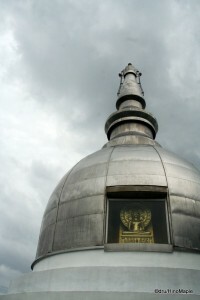 We took a few photos and admired the cold stainless steel that made up the stupa. We then high tailed it out of there as we had just 30 minutes to get to Mazda Stadium which was about 10-15 minutes from Hiroshima Station. After visiting Shukkeien and Nipponzan Myohoji, we went to the Hiroshima Carp game which I wrote about in Japanese Baseball. The game was a lot of fun but the rain delays did make it hard to stay for the whole game. When visiting a city that isn’t your home, you tend to want to watch the entire game rather than leave early. After the game we headed to an izakaya to enjoy a little kushikatsu and yakitori. It was a nice evening that ended my trip to Hiroshima. While I did have moments of nothingness, it was also packed with lots of things to see and do. I made the most of this trip and saw as many new things as I could. My last day in Hiroshima wasn’t really a day in Hiroshima. It was a day to head to Iwakuni to see the somewhat famous Kintaikyo. It was a nice trip that was almost longer than I expected. I was rushing to get through the park and all the sights and still race back to Tokyo. It was a day that started off with me in a packed train, at least till Miyajima, before I got sun burnt in the park and then racing around Hiroshima Station trying to get dinner, omiyage and a seat on the Shinkansen all the way to Tokyo. I arrived in Tokyo at 9pm which was one of the toughest days I had in a long time. All in all it was a fantastic trip and I would love to visit Hiroshima again, but there really isn’t much for me to do anymore except to visit Kure. Sake breweries of Saijo will always be a destination but since I have checked it off of my bucket list, I feel I don’t have to go back anytime soon. I’m sure I’ll be back in Hiroshima someday but I’m not exactly sure when that day will come. This entry was posted in Chugoku and tagged baseball, Fukuya, Henkutsuya, Hiroshiima-ken, Hiroshima, Hiroshima Station, Hitotsubu no Muskat, japan, Japanese Baseball, Kamotsuru, Kure, Mazda Stadium, Myohoji, Nipponzan, Nipponzan Myohoji, rain, Saijo, Seikai no Yamachan, Shukkeien, Yamato Museum by Dru. Bookmark the permalink. What is Hiroshimayaki? Hiroshima okonomiyaki? How is it different from Osaka’s? (°ヘ°)? PS: Ever been to Nagasaki? That’s next on my “want to see” list, mostly thanks to its long history with Holland. Hiroshimayaki? It is Hiroshima Okonomiyaki. They make it in layers rather than mixing it all together. You can also find it with the Kyushu category on the right. Thanks for all those links! I’ve made a few adjustments to my Nagasaki wish list. ^^ What’s the best way to get there? Train? Plane? I flew in. My trip was, fly in, head to Huis Ten Bosch. Then to Nagasaki. 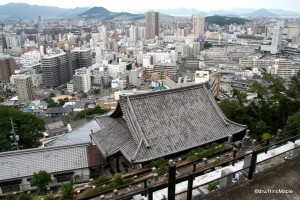 Stayed in Nagasaki and then flew out from Nagasaki. Might be cheaper to fly to Fukuoka now and take the train in. I wouldn’t take the train. Takes too long. I hope it taste better than it looks! Yup. It isn’t the best thing in the world but it is nice. Just dig in and don’t think about the looks.